n Turkey, at the Incirlik Air Base, airman Joseph Fullam was a military policeman working the “search pits,” open-air posts where Americans hunt for explosives and weapons in passing cars and vehicles. Shifts lasted 12 hours, in desert heat of up to 110 degrees. He and his Air Force buddies on the base were envious of the military dog handlers they worked next to because they were required to take air-conditioned breaks every four hours — for the benefit of the bomb-sniffing dogs. But Fullam did get to work with the dog handlers doing search and bite training. And yes, there were casualties in his unit, he says quietly. As has been reported increasingly in the media, many soldiers have taken their own lives. Two sergeants in Fullam’s unit did. Two others perished accidentally while the unit was stationed at home in Montana. Now, after four-and-a-half years in the Air Force and two years of civilian life, Fullam, 25, can hardly believe his good fortune. He is a criminal justice major at FDU’s Metropolitan Campus with his sights set on a career in drug enforcement or homeland security. His Post- 9/11 GI Bill benefits are paying his tuition and will subsidize his Hackensack apartment rent. Until his GI benefits expire, Fullam won’t have to touch the college fund he accumulated as an elevator mechanic after he left the Air Force in 2008.
ullam is part of a vanguard, one of thousands of military veterans to return to U.S. civilian life after deployment in Iraq, Afghanistan and other global hotspots. In gratitude for their service, the U.S. Congress voted in 2008 to upgrade the legislation that educated 8 million veterans after World War II but had failed to keep up with the rising cost of higher education. The Post-9/11 GI Bill, which took effect in August 2009, pays up to 100 percent of a qualified veteran’s tuition at the most expensive public school in the state in which the veteran enrolls. But private schools can participate in the Yellow Ribbon Program, which pays the remainder of a qualified veteran’s tuition, divided equally between a grant from the school and an additional Veterans Administration (VA) payment. Even before the recent bill was passed, FDU had a number of key programs in place. For example, the Center for Psychological Services has been treating veterans since 1983, and the Anthony J. Petrocelli College of Continuing Studies has provided online and affordable degree programs for National Guard members since 2003. Gearing up for the expected influx of veterans, FDU created both an Office of Veterans Services and a Veterans Services Advisory Board to manage and oversee the wide range of benefits, assistance and programs for veterans. 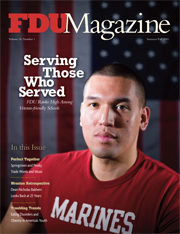 In 2009, FDU’s model programs for veterans were nationally recognized when the American Council on Education and the Wal-Mart Foundation named FDU as one of just 20 colleges — and one of only two private schools — to earn a $100,000 Success for Veterans grant. Far more than most private universities, FDU has embraced the Yellow Ribbon Program, placing no limits on the number of scholarships it awards or duration of study at the University. “Some universities set a cap,” says Jason Scorza, associate provost for global learning and co-chair of the Veterans Services Advisory Board. “They’ll give only 10 Yellow Ribbon scholarships per year, or they exclude graduate programs or doctoral programs. “At FDU, we decided we would offer the grant to any qualified student,” he says. 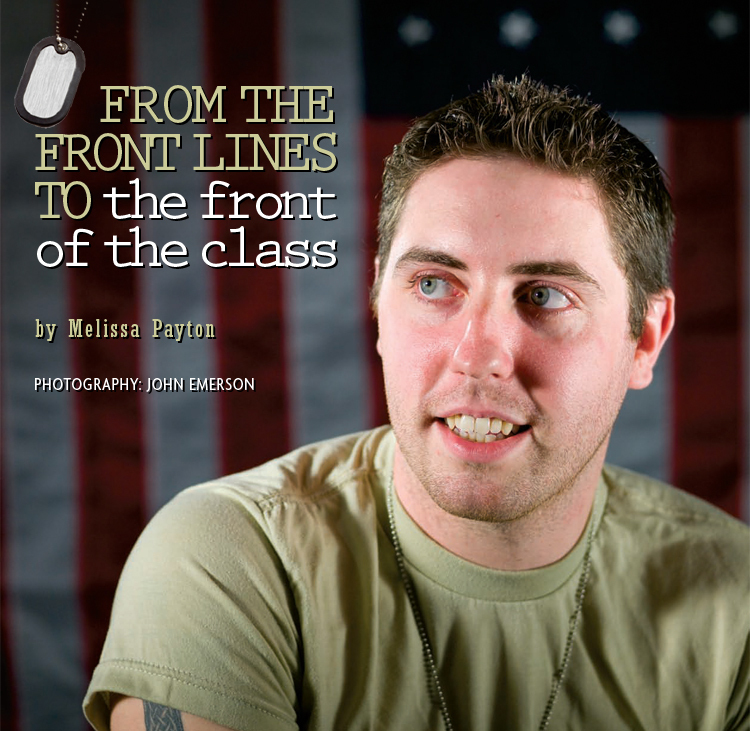 “As a result, any veteran who meets the qualifications for admission and for the Yellow Ribbon program can come to the University for free.” Thirty-four student veterans had Yellow Ribbon scholarships at FDU in spring 2010, a number that is expected to grow. Total veteran enrollment at FDU increased from 70 in 2008 to 170 in spring 2010, the largest enrollment of veterans among New Jersey’s independent colleges. This is partly due to the sheer numbers of returning veterans, Scorza notes. (Almost 3,000 veterans returned to New Jersey in June 2009 alone.) But Luna says FDU’s reputation for supporting veterans is spreading rapidly, and the University could host many more student veterans in a few years. *This page ammended February 7, 2013 — RM.